(CNS): Organisers of next year’s Off the Beaten Track, Cayman’s ‘ultra’ marathon, are calling for relay teams from companies on the island to join forces with some of Cayman’s most prominent professional firms, to make this year’s event the most well-attended ever. The event will be held on Sunday 26 February. Off The Beaten Track is organised by local runner Kenneth Krys, of Krys Global, and is a one-of-a-kind, ultra-marathon designed to create the atmosphere of Morocco’s Marathon des Sables, in which Krys has participated. Now in its third year, Off the Beaten Track sees teams of six running in relay over a distance of approximately 50 kilometres across and around the island. Krys says the route is complex to really test the runners, incorporating beach, dyke roads, back streets, and so it is aimed at fit runners who are comfortable running under such conditions. Krys has just recently returned from a six stage run through the Amazon jungle. 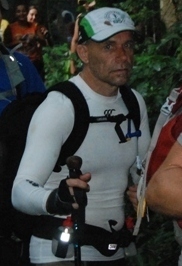 Buoyed up by his recent race success, Krys says he will be adding some new challenges to this year's Off the Beaten Track race to incorporate some of the events and difficulties from the Jungle Marathon, including some water crossing and trekking through the bush. “Along with international recognition, we are expecting the biggest field ever this year. Already people on and off island are seeking more information and indicating they plan to attend,” he states. At least 50 per cent of the monies raised from the run will be donated to Facing Africa, a charity which assists people with NOMA, a flesh eating disease that affects young children, those living in poverty and the malnourished living in Sub Sahara Africa. He confirms that the remainder of monies raised will go to local charities, in particular those that assist children in the local community. Last year the race raised almost $20,000 and the organisers say they would like to reach that level again this year. Krys is looking for sponsors and volunteers to assist. Visit www.offthebeatentrack.ky for more information.